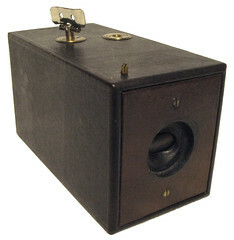 In 1879 George Eastman, amateur photographer and employee of a bank in Rochester, had invented an emulsion-coating machine for mass production of dry plates and got a patent on it in England. In 1881 he and Rochester's local buggy whip manufacturer Henry A. Strong founded the Eastman Dry Plate Company in the town in the north of the state of New York (USA). In 1883, a year after having solved troubles with bad quality gelatine that spoiled film plates, the company moved to a four-story building which later got the address 343 State Street, longtime headquarters address of the company. In 1884 Eastman and Strong transformed their partnership to a corporation for which they gathered the first shareholders. 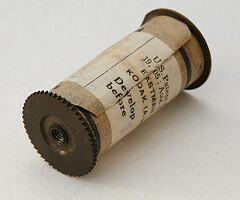 In 1885 the American Film was introduced, a paper roll film which needed a special development process, made usable with the new Eastman-Walker rollfilm holder. 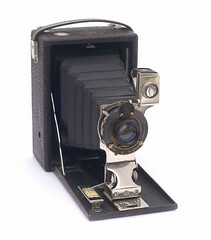 This was used later in the first two Kodak cameras. However Eastman knew that he needed a transparent film for the future, and hired the chemist Henry H. Reichenbach as research scientist. The transparent roll film would be delivered in 1889. Eastman's goal in life was to simplify and to popularize photography. 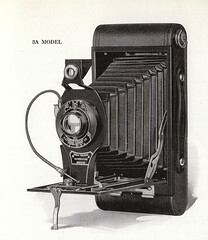 The first step towards that goal was the "Kodak" camera he introduced in 1888 which had a built-in 100-exposure paper roll film costing $25, a huge amount. 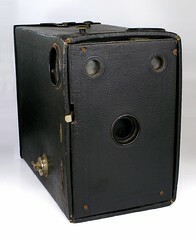 The box camera had to be sent back to the factory once all the exposures had been used. The customers got their cameras back with new film roll loaded into it, and the image prints. 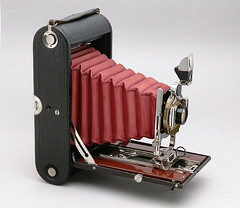 In 1890 a Kodak folding camera with built-in 48 exposure film roll followed. 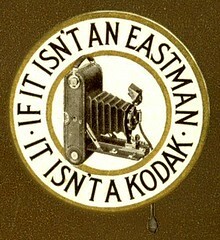 After years of advertising the brand Kodak the company was renamed Eastman Kodak Co. 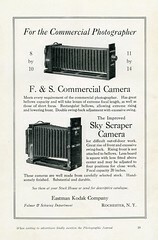 In 1900 Eastman had reached his goal, offering the Brownie rollfilm camera which cost only $1 including a 6 exposure film. 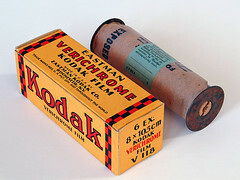 Further film rolls cost just 15 cents. 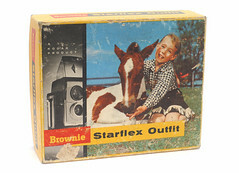 The Brownie camera series was continued until 1970. 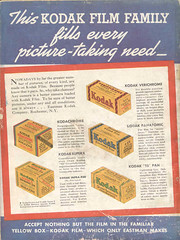 Kodak used to have autonomous branches in other countries, which developed their own lines of products, as Ford did for cars. 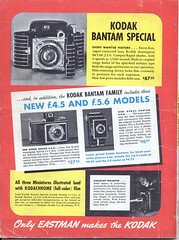 The German branch Kodak AG, which made the famous Retina models, is discussed in a separate page, as is Kodak Ltd. (UK). 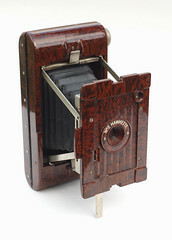 With exception of the Mexican plant all these international branches made cameras. Most U.S. plants outside Rochester specialized in producing basic materials like gelatine (Peabody/Massachusetts), plastics (Longview/Texas), chemicals (Batesville/Arkansas), polyester fibre (Columbia/S.C. ), and basic materials for film making and others (Kingsport/Tennessee). Some of the films and plates were made in Windsor/Colorado. 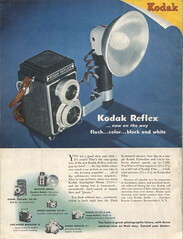 At its peak, the company was huge and made everything connected with photography: cameras, lenses (including some of the best lenses of the mid-20th century, see Kodak lenses), film, and processing chemicals and equipment, in addition to photographic materials used in the graphic arts industry (for example, for printing). It also conducted important photographic research and development. 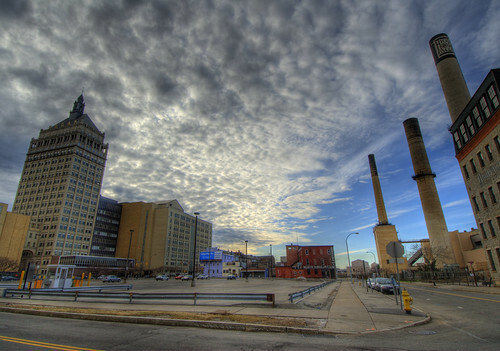 60,000 people were working for Kodak in Rochester. In 1966 the company had 100,000 employees worldwide. remind users of the appropriate sort of film. 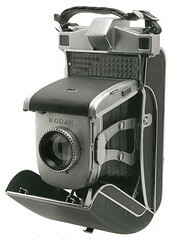 In 1975 electronics engineer Steven Sasson developed Kodak's first digital still camera (for 0.1 megapixel black&white exposures), based on CCD technology. 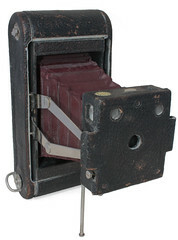 Kodak didn't pay much attention to this invention as their main focus was film. 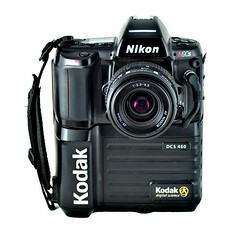 In 1994 they helped Apple develop and market the Quick Take 100 and 150 digital cameras while Kodak's focus in the digital camera section was aimed at reporters and journalists (Kodak DCS series). 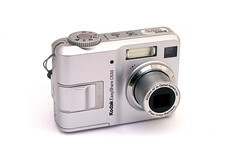 Consumer digital cameras were marketed from 1995 on under the brand Kodak (Kodak DC40). In August 2006 they abandoned the production of digital cameras by outsourcing the production to Flextronics, an all-and-everything OEM manufacturer in Singapore. 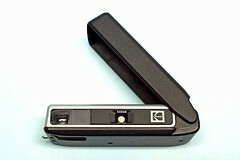 By the 1980s, Kodak's dominant position in photography had begun to erode for a variety of reasons, including more aggressive marketing from Fuji and the rise of sophisticated 35mm point and shoot cameras from Japanese manufacturers. Years of steady profits had led to a conservative, risk-averse management style. 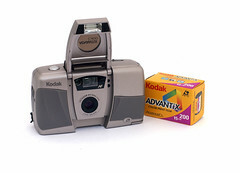 During the 2000s, mass photography shifted overwhelmingly to digital cameras, which put sales of Kodak's traditional film, paper, and chemistry into a steep dive. Despite shedding many products (such as black & white enlarging paper and Kodachrome film), by 2011 the company had become a consistent money-loser. A last-ditch effort to sell off the company's war chest of patents (many involving digital imaging) did not meet with much success; and on January 19th, 2012 the company filed for Chapter 11 bankruptcy protection. In January of 2013, JK Imaging Ltd. is licensing the Kodak brand for consumer digital camera products. In April of 2013, the personalized imaging and document imaging businesses divisions were acquired by Kodak's UK Pension Plan (KPP). 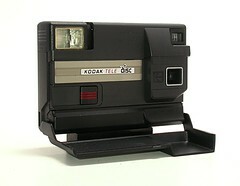 The acquisition will be under the name Kodak Alaris. They will be using the Kodak branding for consumer and professional films along with retail photo kiosks and paper products. Eastman Kodak emerged out of bankruptcy protection in August 2013 and concentrates its business on commercial printing and packaging services. 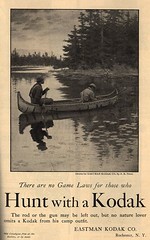 1905: Hunt with a Kodak. Kodaks for the better off. 1937: no photo w/o appropriate film. 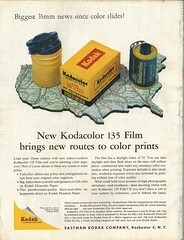 1958: Kodacolor 135 rules the World. 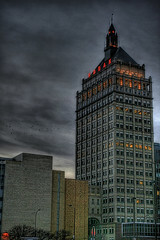 ↑ Headquarter, image by THEjdawg, license: image used with permission, all rights reserved. ↑ motto logo, image by Mario Groleau, license: Creative Commons (not for commercial use). ↑ Kodak's petition for Chapter 11 bankruptcy filed 19 January 2012, posted to Scribd by the New York Times "DealBook." ↑ U.K. Kodak Pension Plan Completes Acquisition of Eastman Kodak Company's Personalized Imaging and Document Imaging Businesses at PR Newswire - Sept 2013. 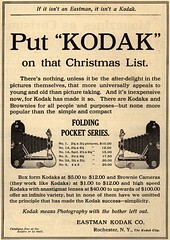 For much of its history, Kodak operated on what has been called the "razor blade" business model. 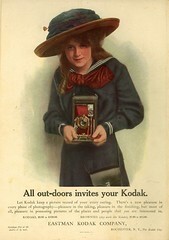 Camera manufacture was not Kodak's primary source of profits; instead, affordable cameras generated an ongoing, steady demand for photographic consumables: film, chemistry, and print paper. 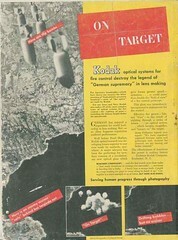 See the article Kodak film for a listing of the company's main film brands. 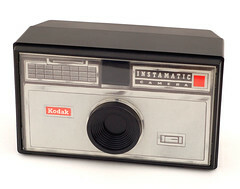 Instamatic, see Instamatic 110 list. 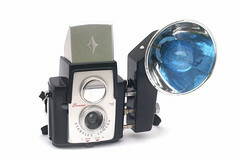 Hawkeye Instamatic, see Instamatic 110 list. 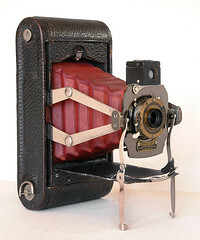 Tele-Instamatic, see Instamatic 110 list. 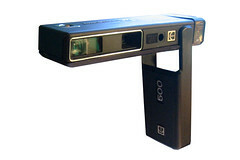 Pocket Instamatic, see Instamatic 110 list. 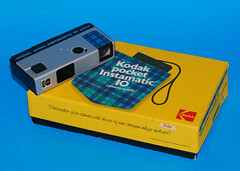 For Kodak instant film products see Kodak Instant. The Kodak Magazine (UK) - a photography magazine for the general public published by Kodak Ltd.
BRAYER, Elizabeth: George Eastman: A Biography, University of Rochester Press, 2012. ISBN 978-1580462471. McKEOWN, Jim & Joan: Collectors Guide to Kodak Cameras, Centennial Photo Service, 1981. ISBN 0-931838-02-9. 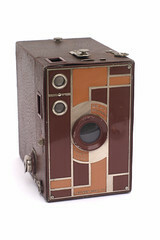 History of Kodak (archived) on Kodak's website. 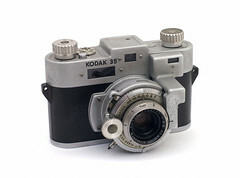 History of Kodak Cameras (archived), a complete list with all the cameras made by Kodak from 1888 to 1999, dates, film sizes and original prices, on Kodak's website; PDF available.